No region of the world today is more dynamic than Asia. Across the continent, booming countries have built engines of economic growth that have lifted hundreds of millions out of poverty. Along with this economic strength has come increased strategic importance, leading to Asia's emergence as a principal center of global power in the twenty-first century. As Asia's economic and strategic weight has grown, Asians have sought to build multilateral frameworks capable of effectively channeling the region's energies. But for more than a decade, the United States has mostly watched from the sidelines as proposals multiply and the region organizes itself into an alphabet soup of new multilateral groups. The Obama administration has an opportunity to help define new roles for the United States in this changing Asia. But to sustain its position in the region, Washington will need to move beyond its traditional "hub and spokes" approach to Asia--with the United States as the hub, bilateral alliances as the spokes, and multilateral institutions largely at the margins of U.S. policy. Otherwise, the United States will pay increasing costs to its interests, credibility, and influence. In this Council Special Report, commissioned by CFR's International Institutions and Global Governance program, Evan A. Feigenbaum and Robert A. Manning examine Asia's regional architecture and consider what it means for the United States. 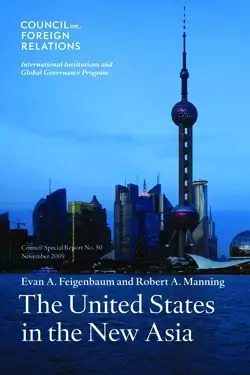 They identify shortcomings in the region's existing multilateral mix and contend that the United States must increase its involvement in shaping Asian institutions in order to advance U.S. strategic interests and protect the competitiveness of American firms. The authors outline six principles for U.S. policy toward Asia as a whole and recommend particular policies toward Northeast and Southeast Asia. Among other steps, they urge the United States to maintain a strong presence at Asian meetings; avoid intractable security issues and focus instead on topics ripe for cooperation; make use of ad hoc groupings as well as formal ones; vigorously pursue regional and global trade liberalization efforts; and view some Asian institutions that exclude the United States as acceptable, just as with the European Union. The report also presents thoughtful recommendations for how Washington can influence the multilateral landscape in ways beneficial to American interests. The result is a document with important implications for U.S. policy toward a region that promises to play a central role in shaping the coming era of history.